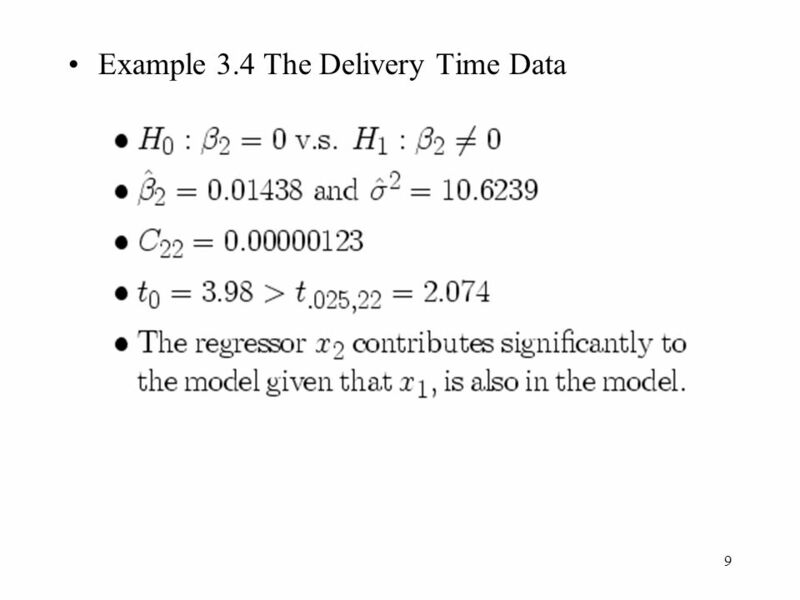 7 R2 and Adjusted R2 R2 always increase when a regressor is added to the model, regardless of the value of the contribution of that variable. 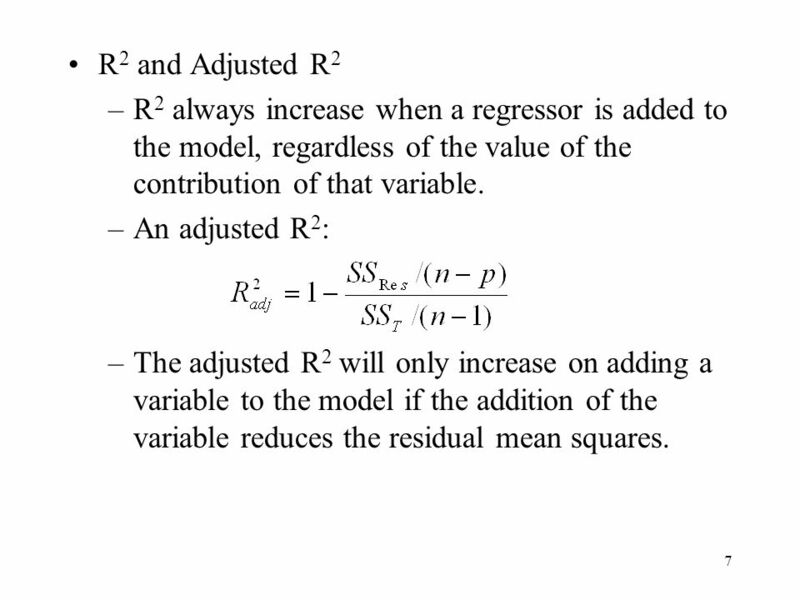 An adjusted R2: The adjusted R2 will only increase on adding a variable to the model if the addition of the variable reduces the residual mean squares. 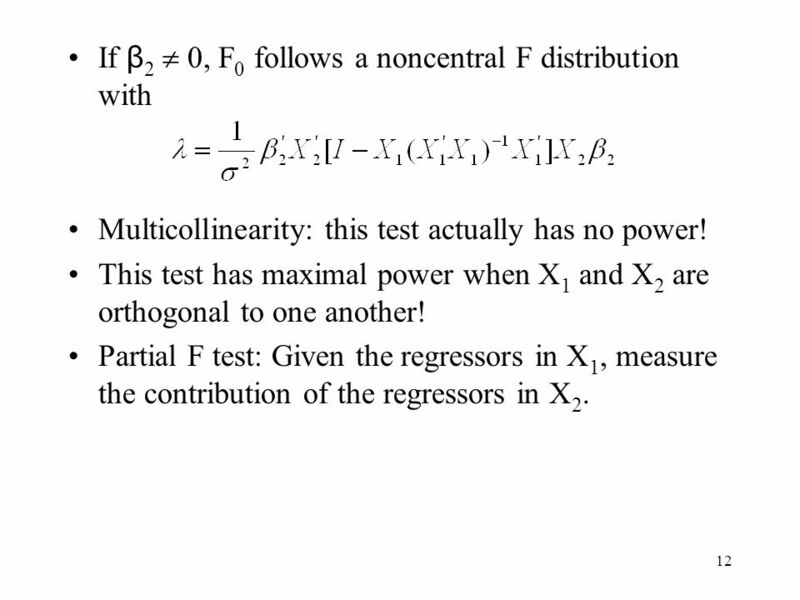 Multicollinearity: this test actually has no power! 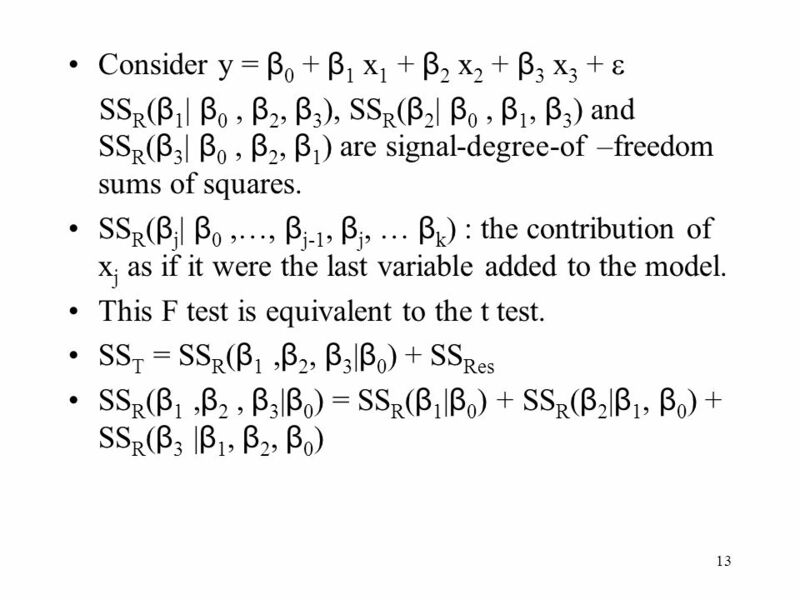 This test has maximal power when X1 and X2 are orthogonal to one another! 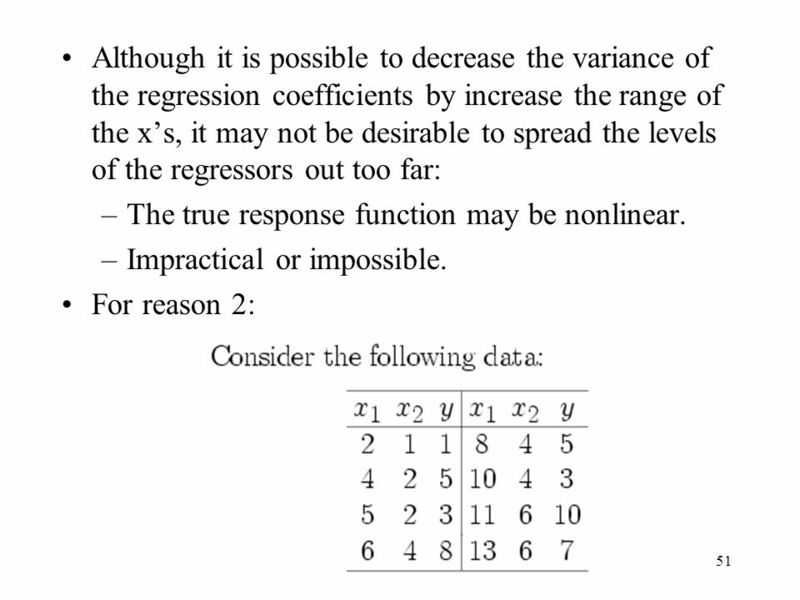 Partial F test: Given the regressors in X1, measure the contribution of the regressors in X2. 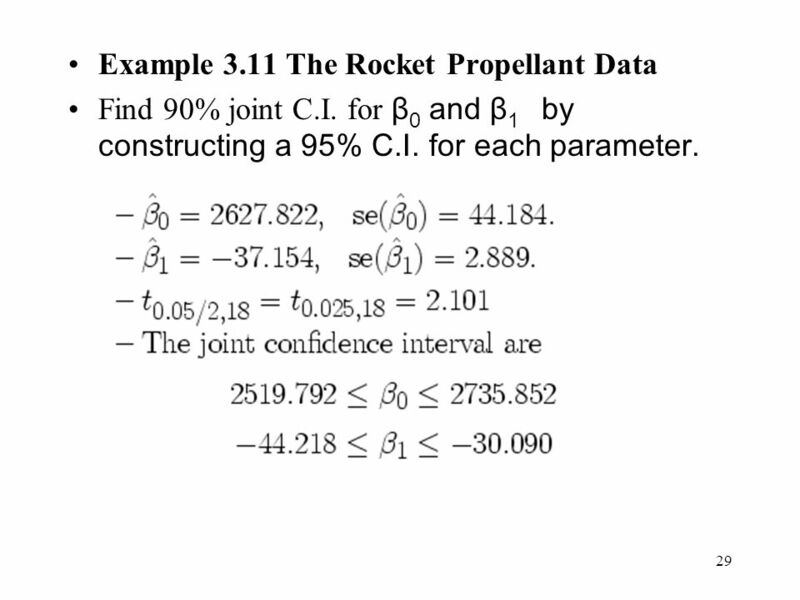 Find 90% joint C.I. 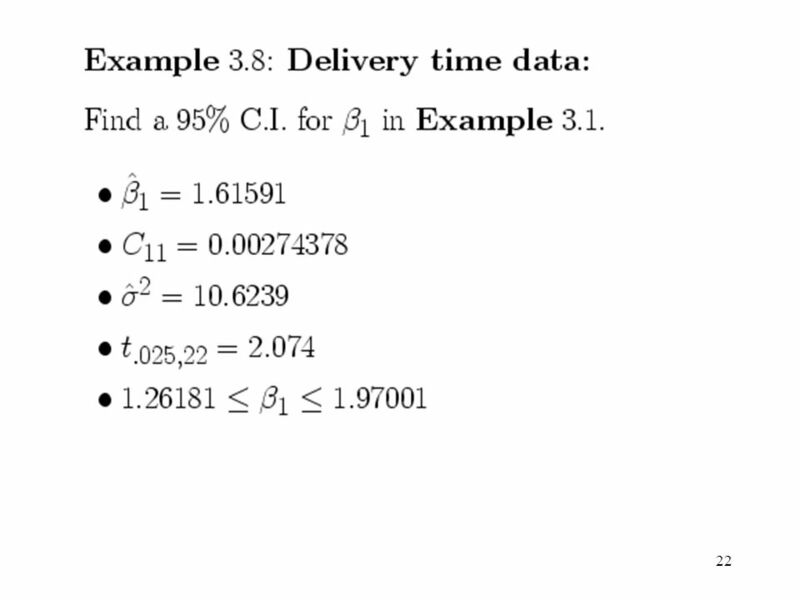 for β0 and β1 by constructing a 95% C.I. 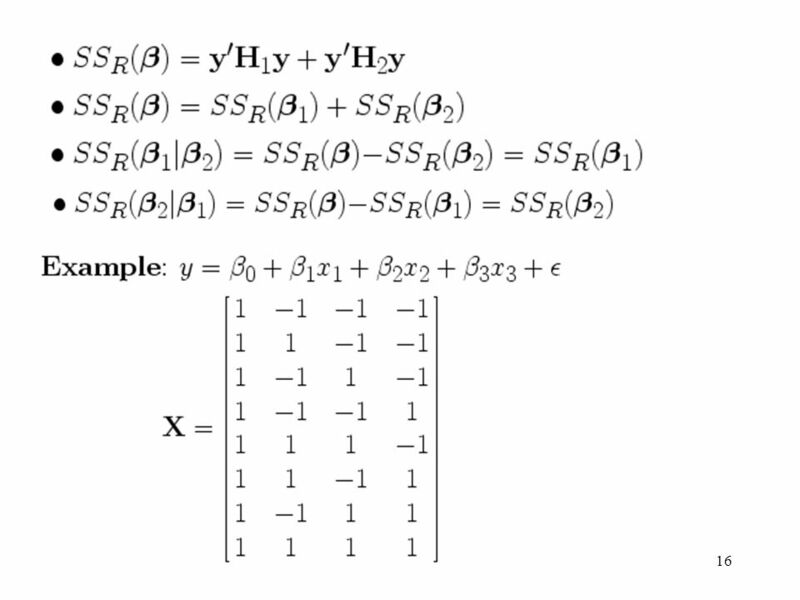 for each parameter. 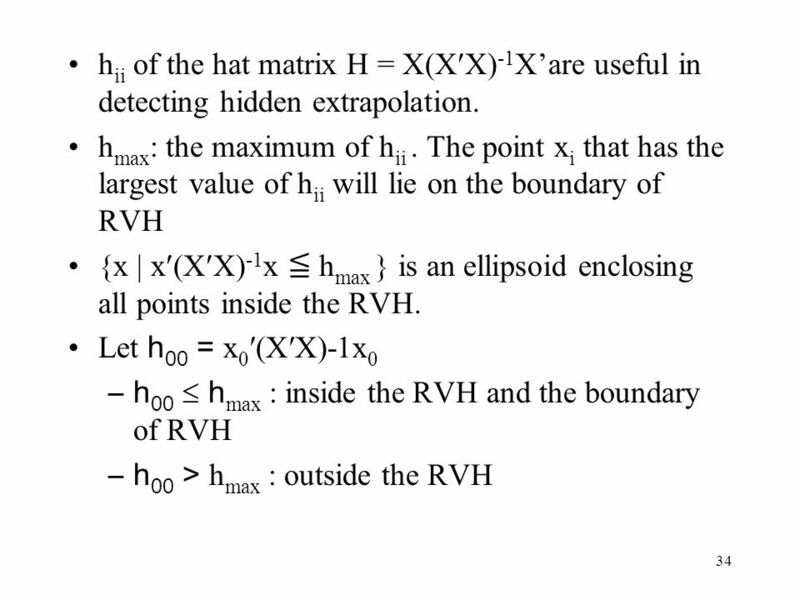 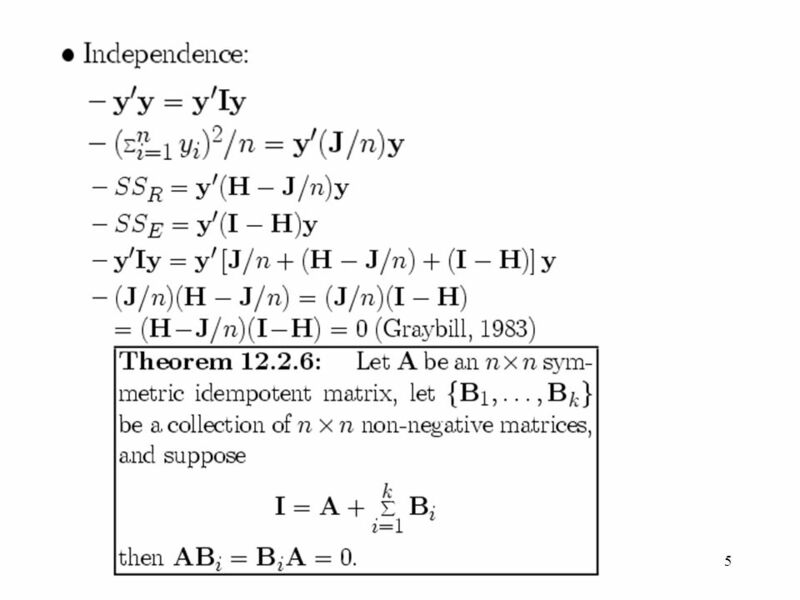 34 hii of the hat matrix H = X(XX)-1X’are useful in detecting hidden extrapolation. 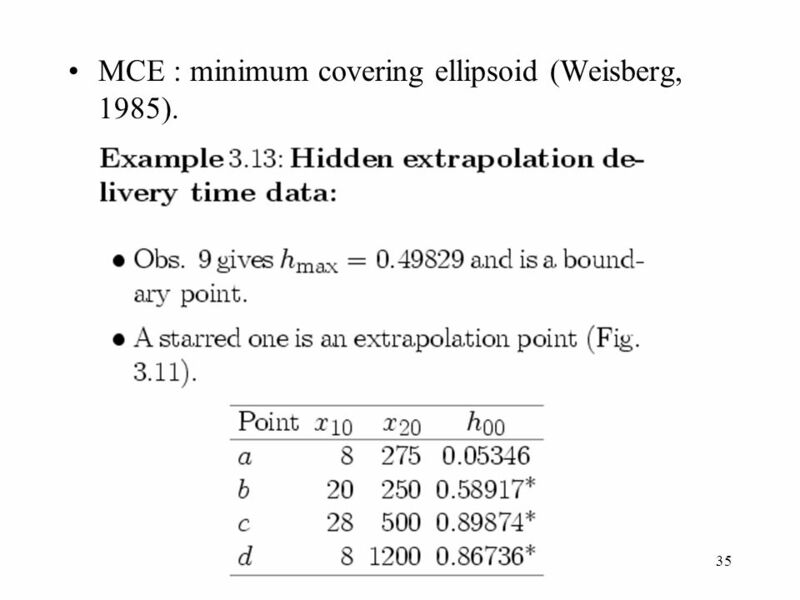 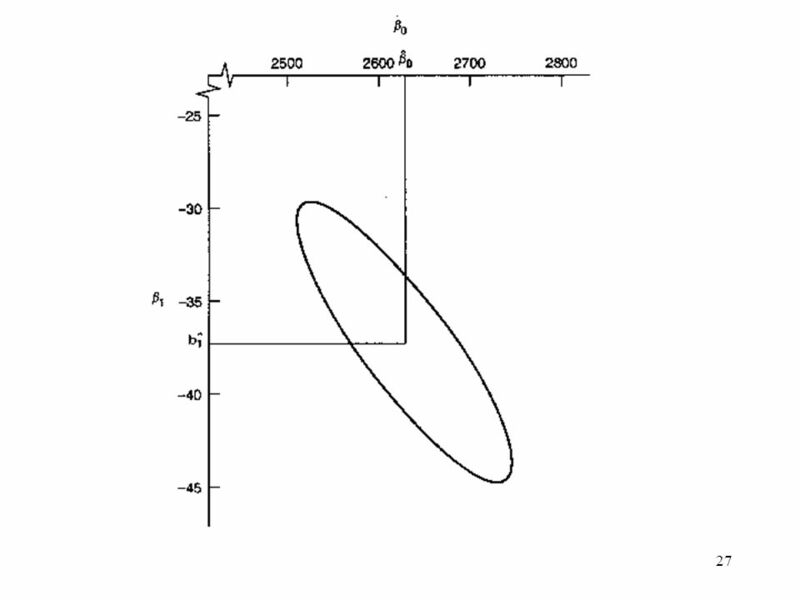 35 MCE : minimum covering ellipsoid (Weisberg, 1985). 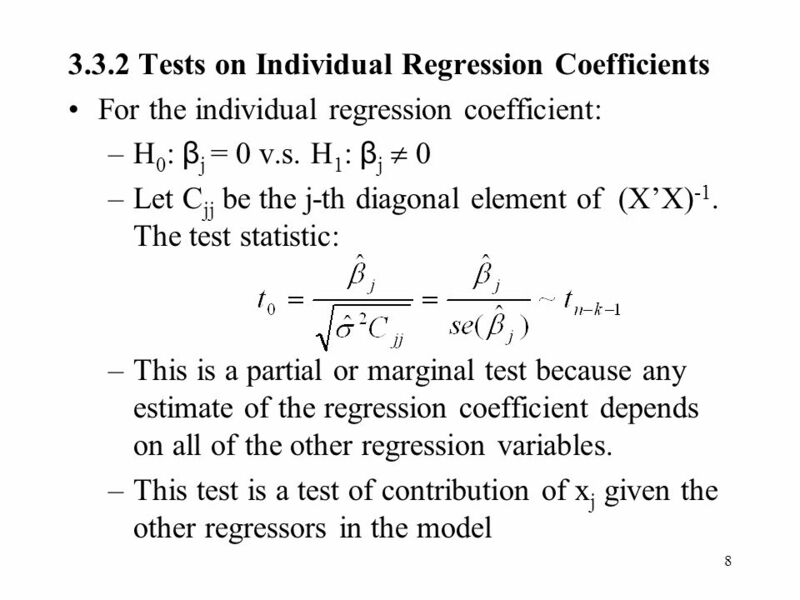 Difficult to compare regression coefficients directly. 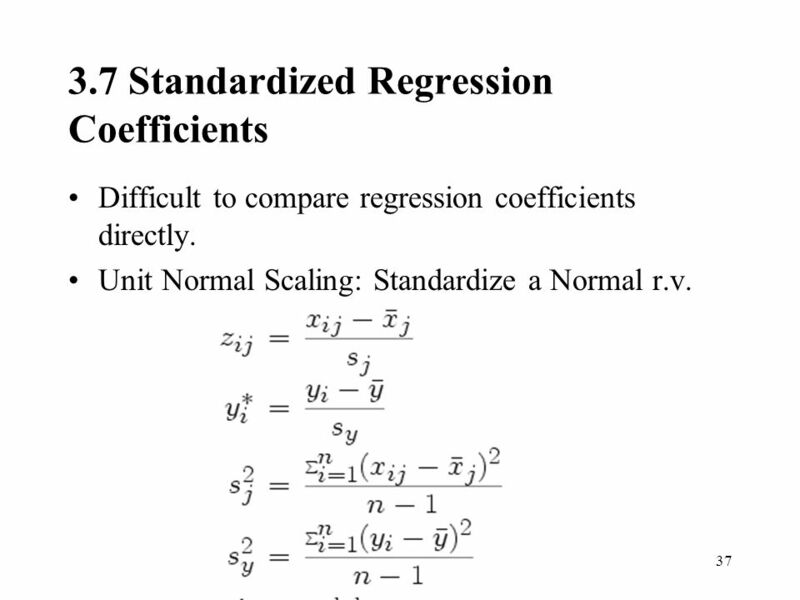 Unit Normal Scaling: Standardize a Normal r.v. 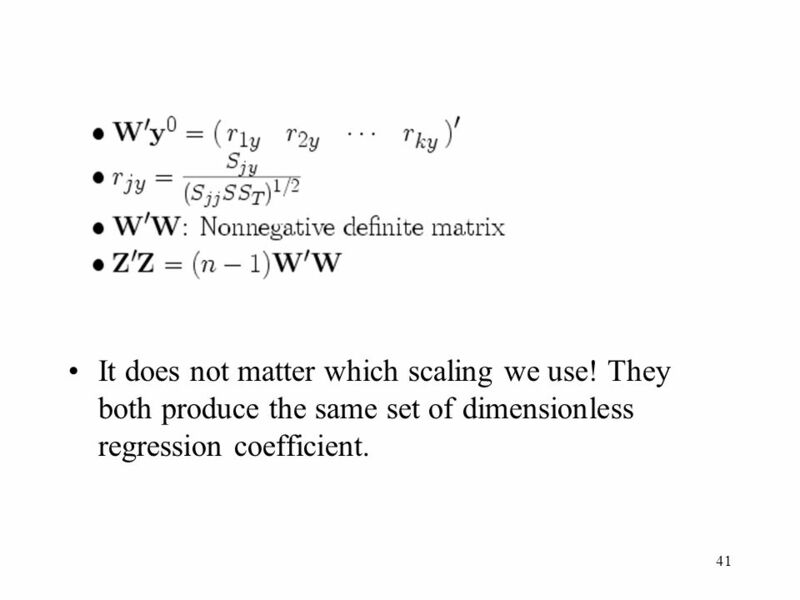 It does not matter which scaling we use! 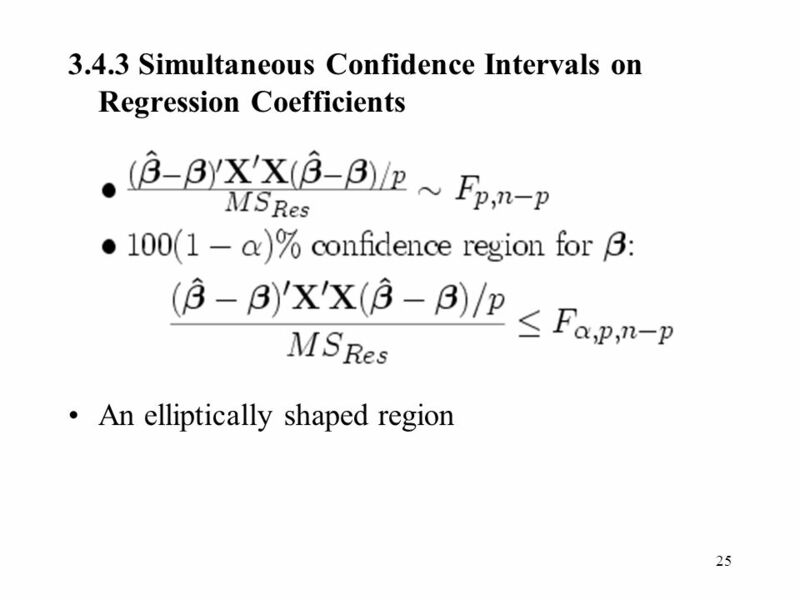 They both produce the same set of dimensionless regression coefficient. 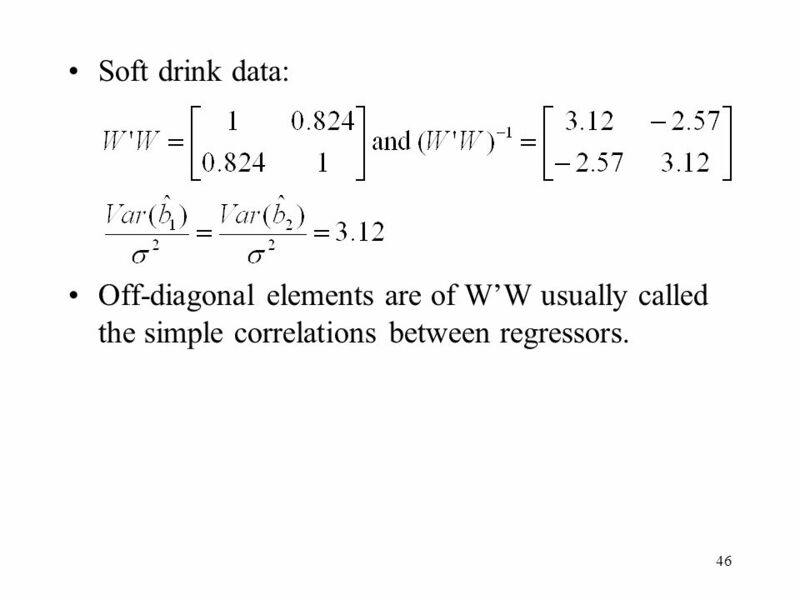 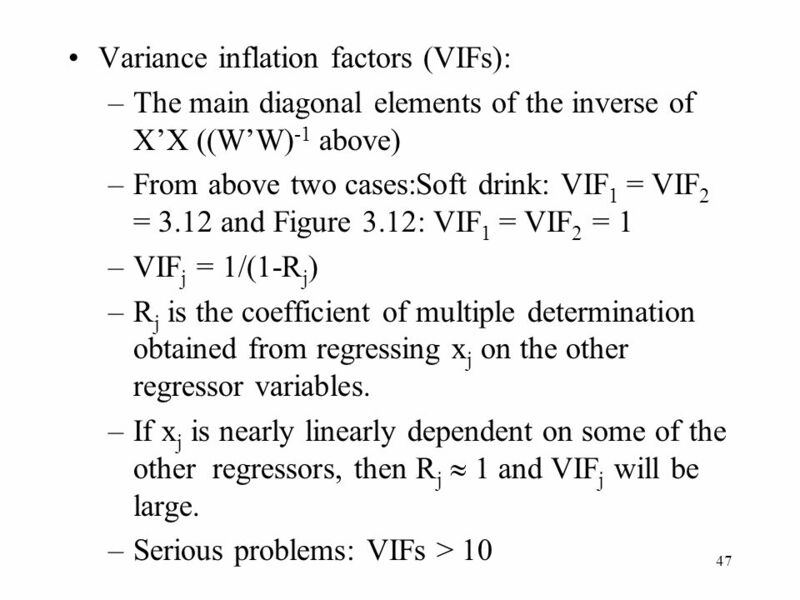 46 Soft drink data: Off-diagonal elements are of W’W usually called the simple correlations between regressors. 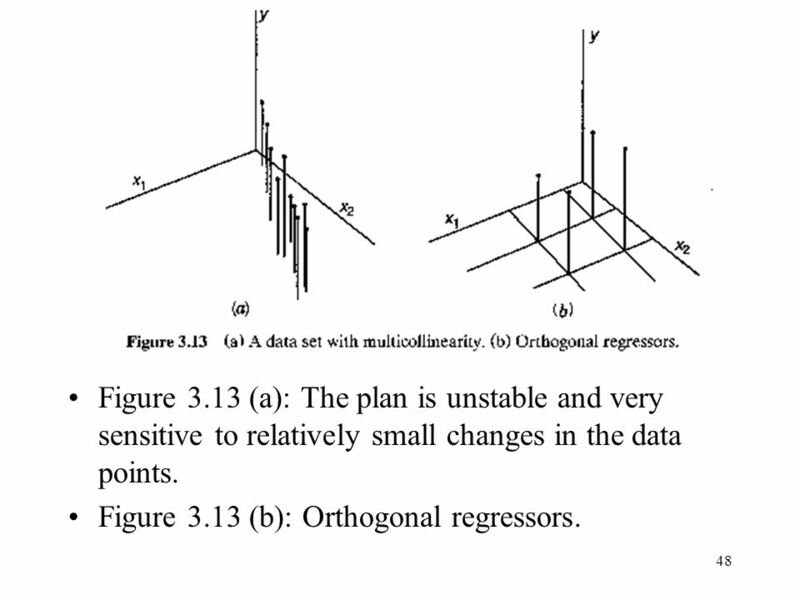 48 Figure 3.13 (a): The plan is unstable and very sensitive to relatively small changes in the data points. 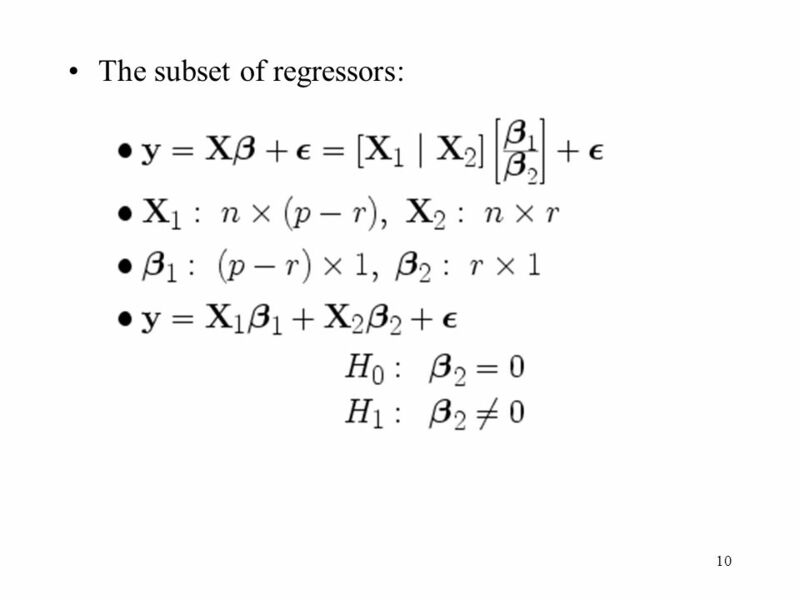 Figure 3.13 (b): Orthogonal regressors. 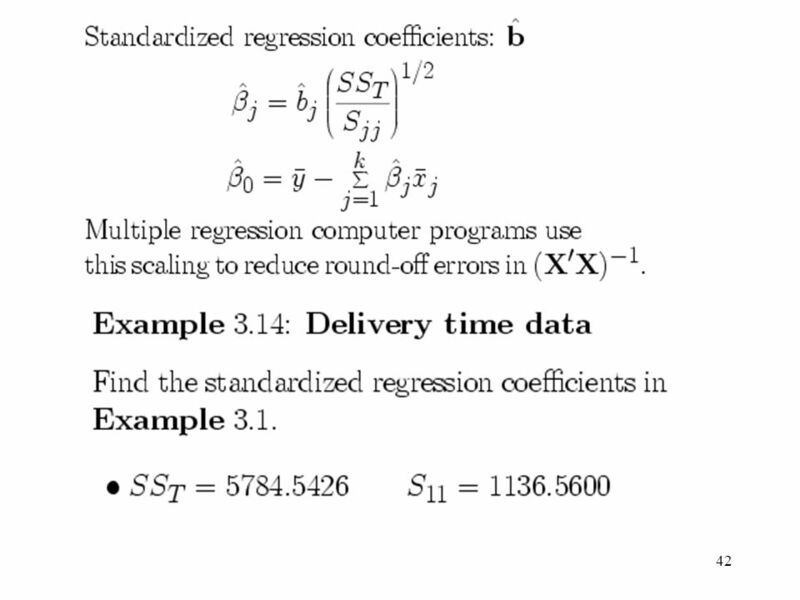 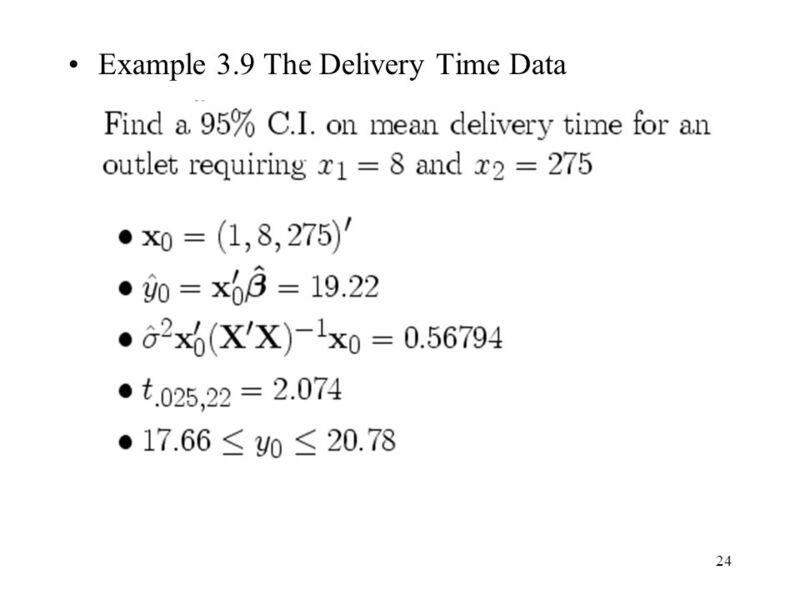 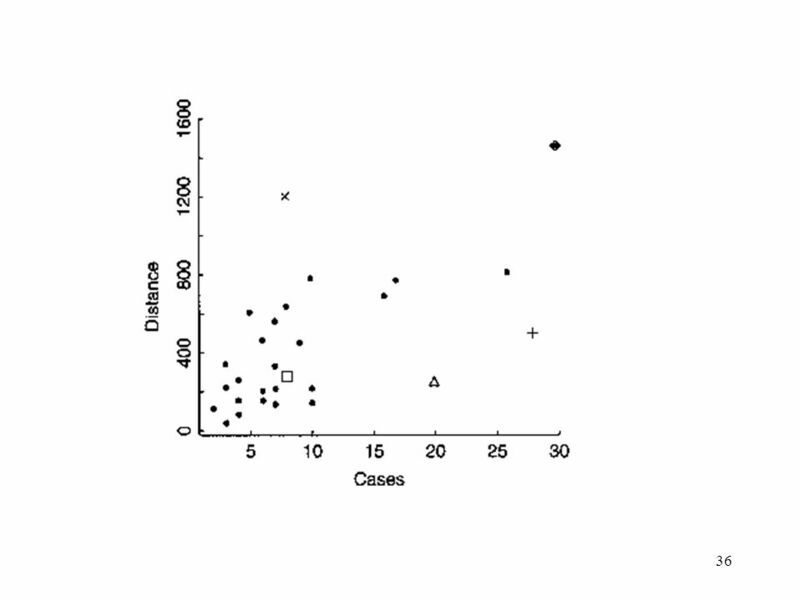 49 3.9 Why Do Regression Coefficients Have the Wrong Sign? 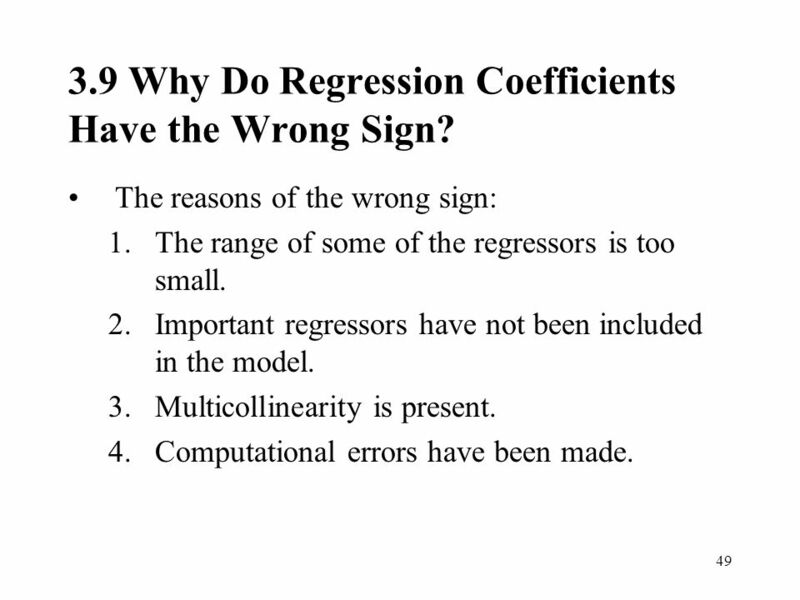 The reasons of the wrong sign: The range of some of the regressors is too small. 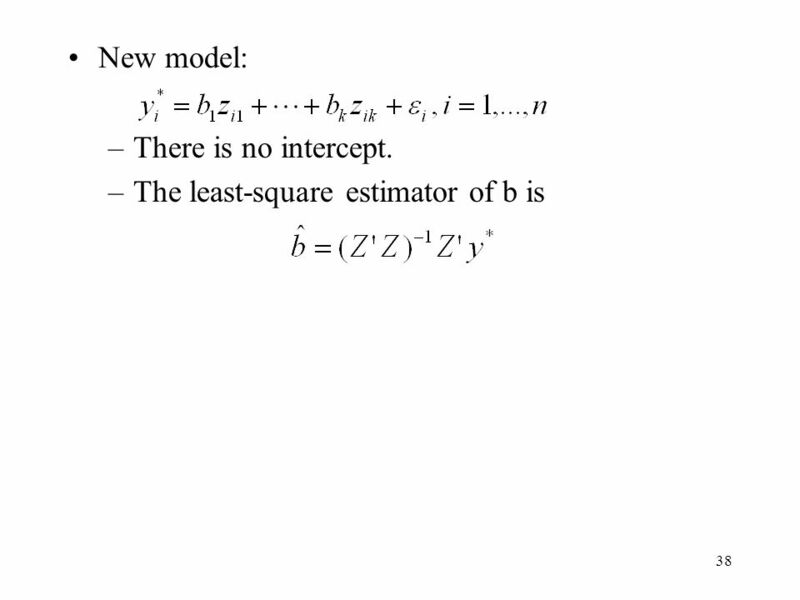 Important regressors have not been included in the model. 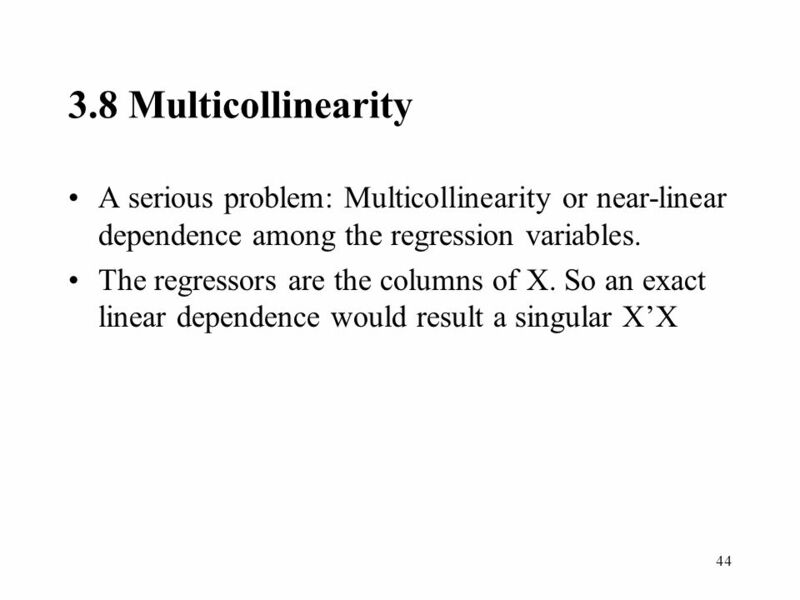 Multicollinearity is present. 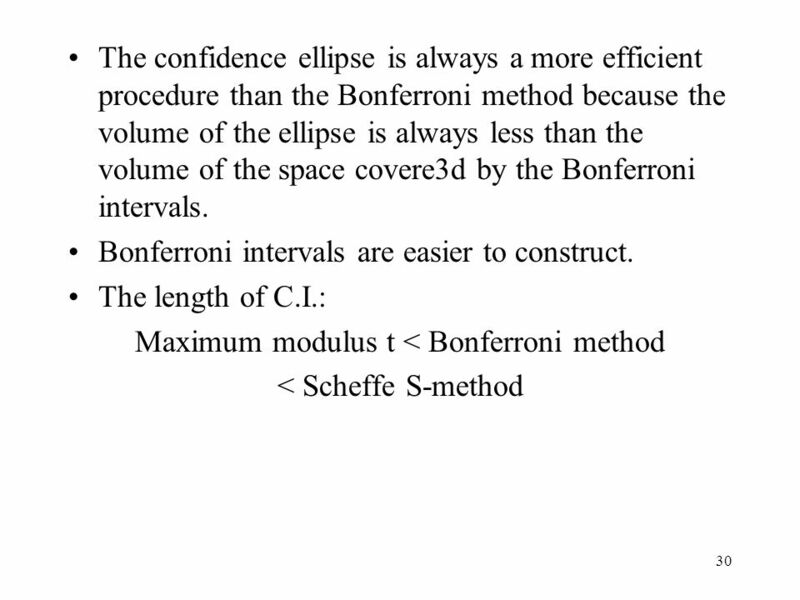 Computational errors have been made. 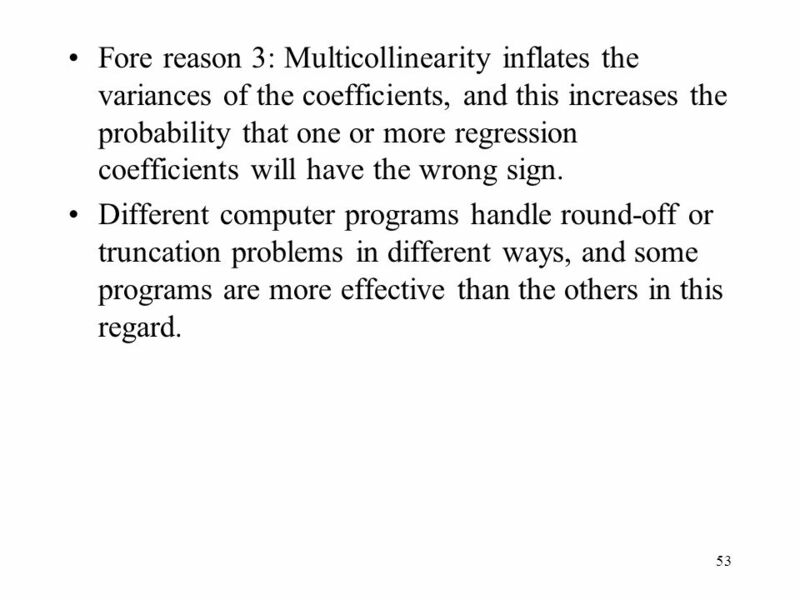 53 Fore reason 3: Multicollinearity inflates the variances of the coefficients, and this increases the probability that one or more regression coefficients will have the wrong sign. 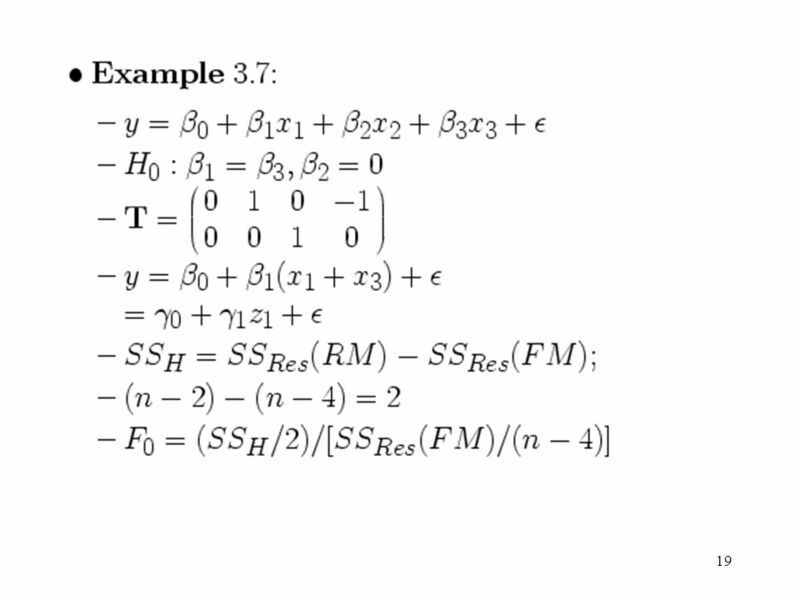 Different computer programs handle round-off or truncation problems in different ways, and some programs are more effective than the others in this regard. 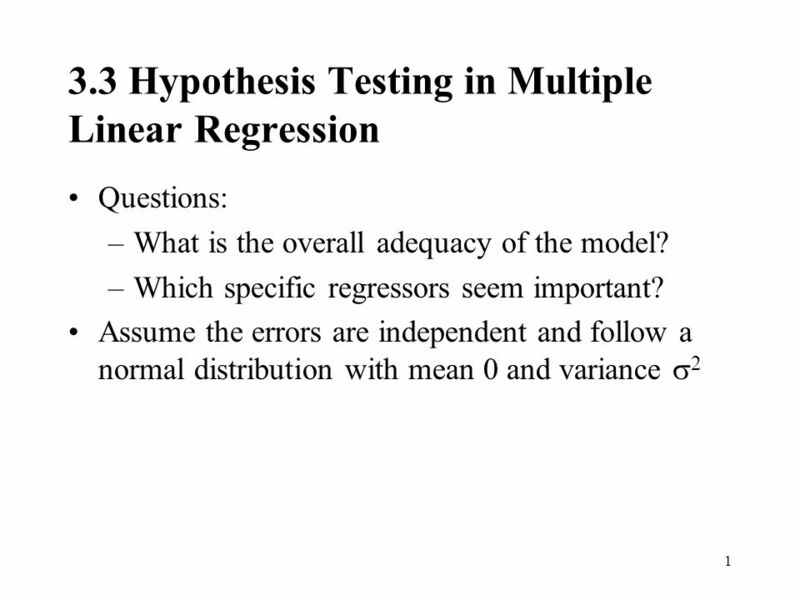 Download ppt "3.3 Hypothesis Testing in Multiple Linear Regression"
12-1 Multiple Linear Regression Models Introduction Many applications of regression analysis involve situations in which there are more than. 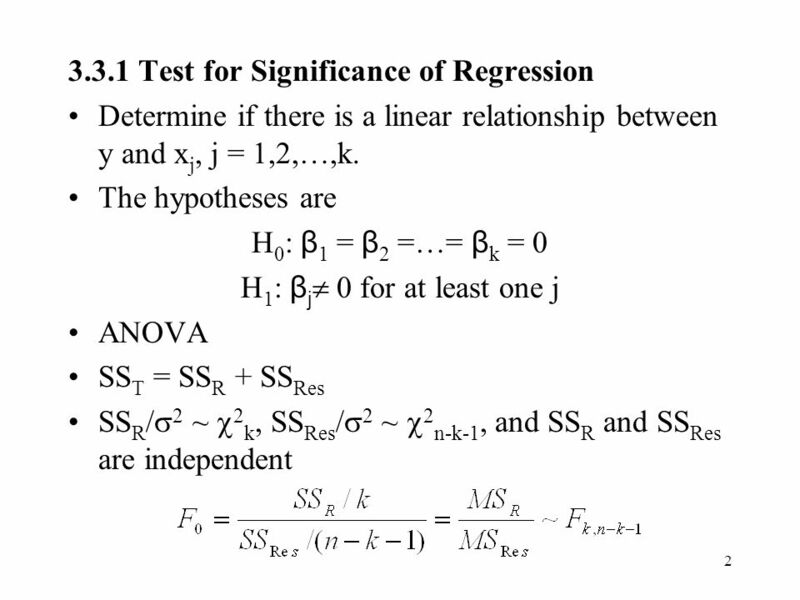 Simple Linear Regression. 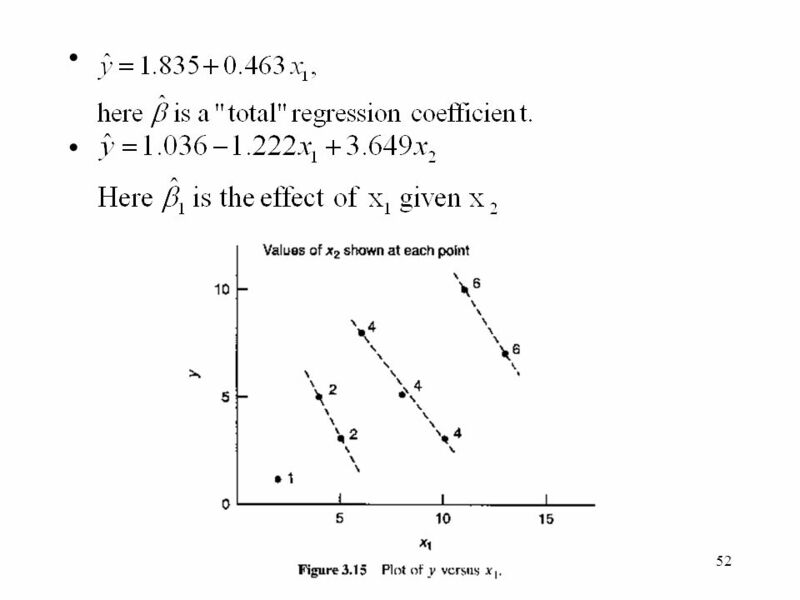 Start by exploring the data Construct a scatterplot  Does a linear relationship between variables exist? 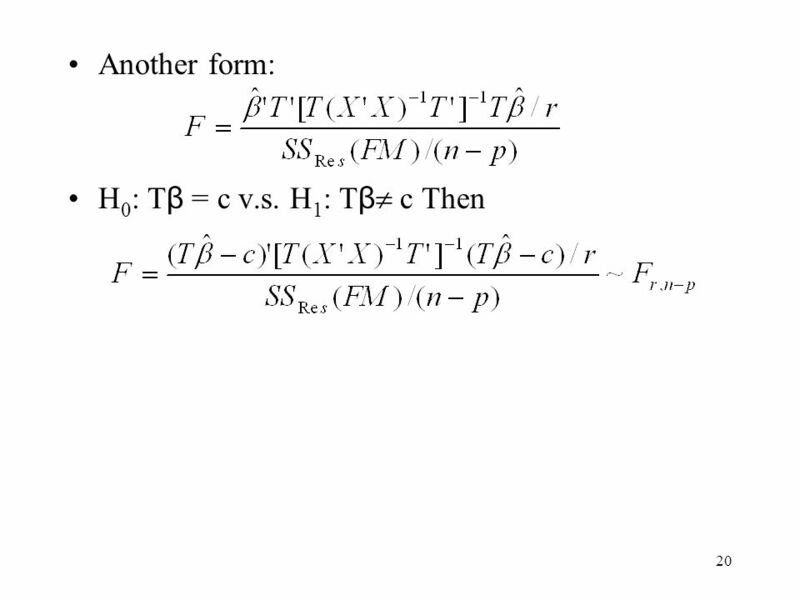  Is the relationship. 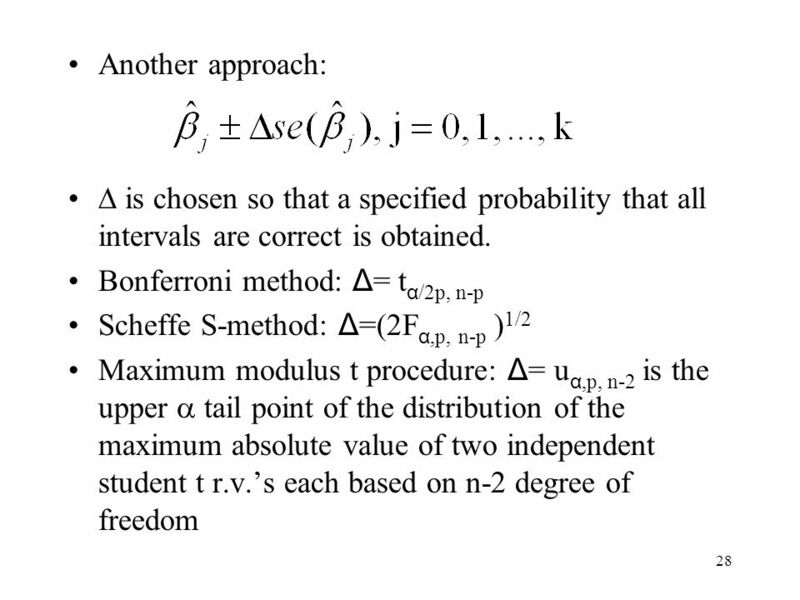 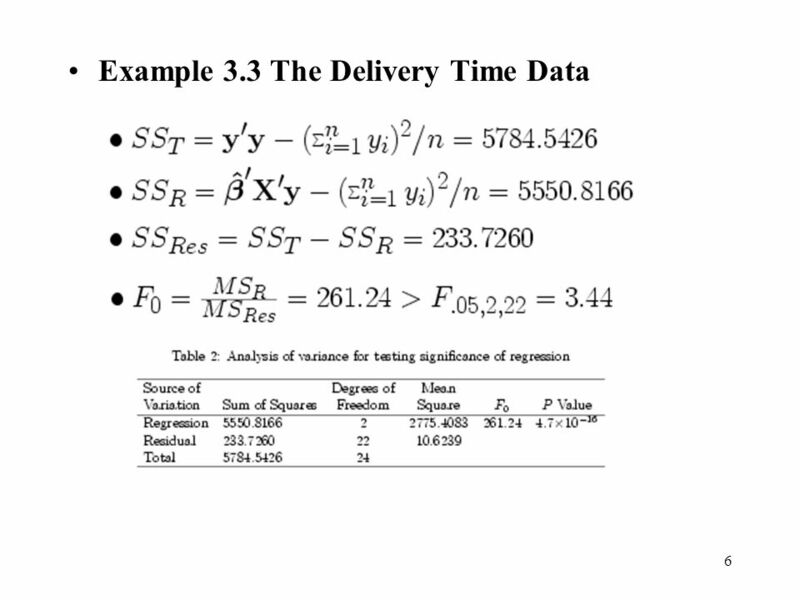 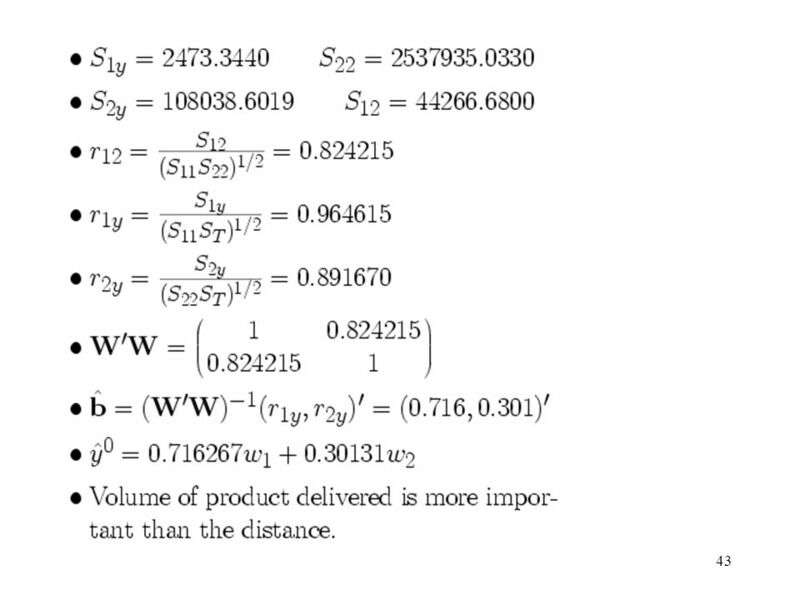 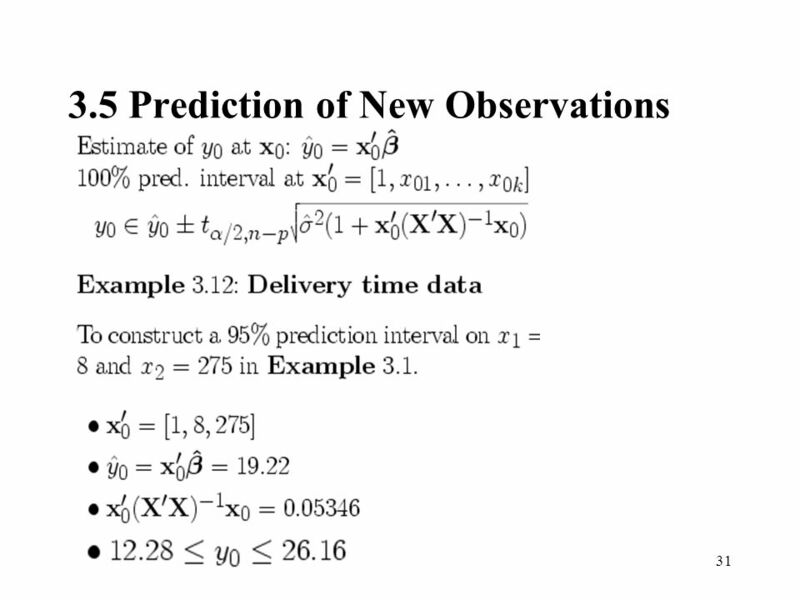 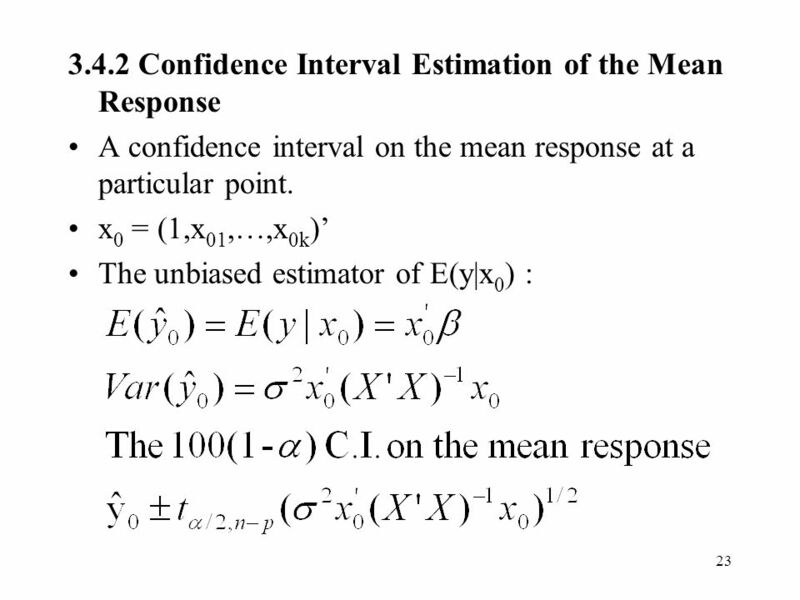 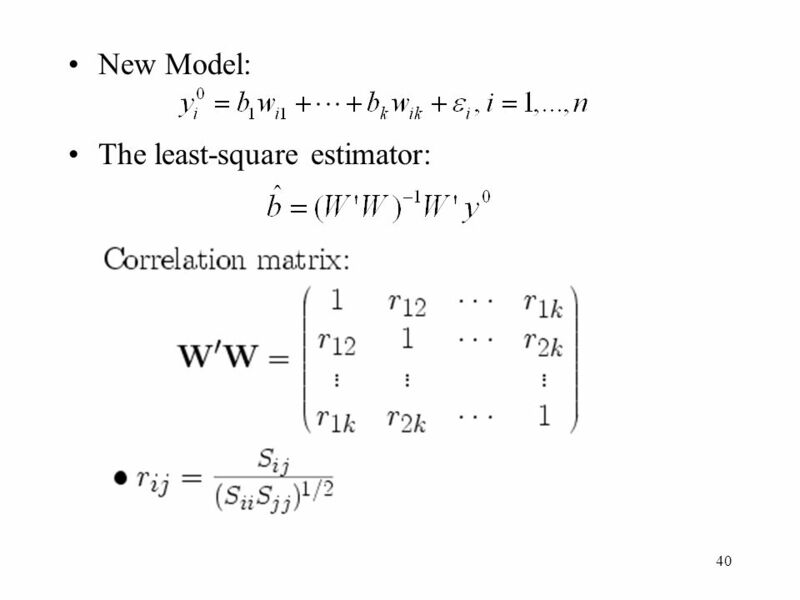 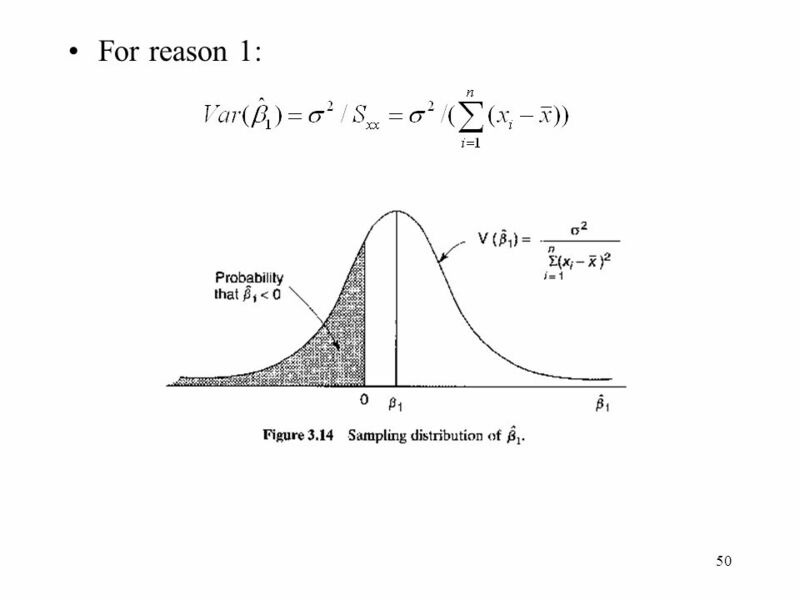 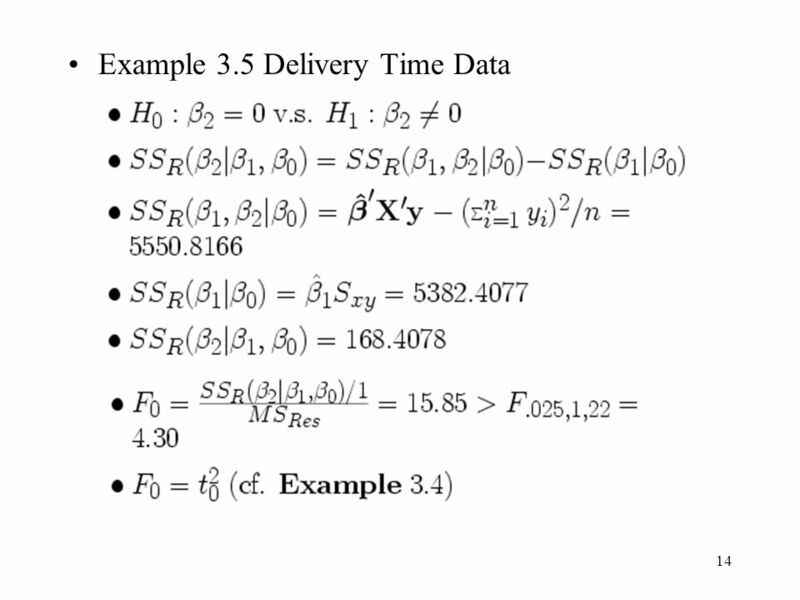 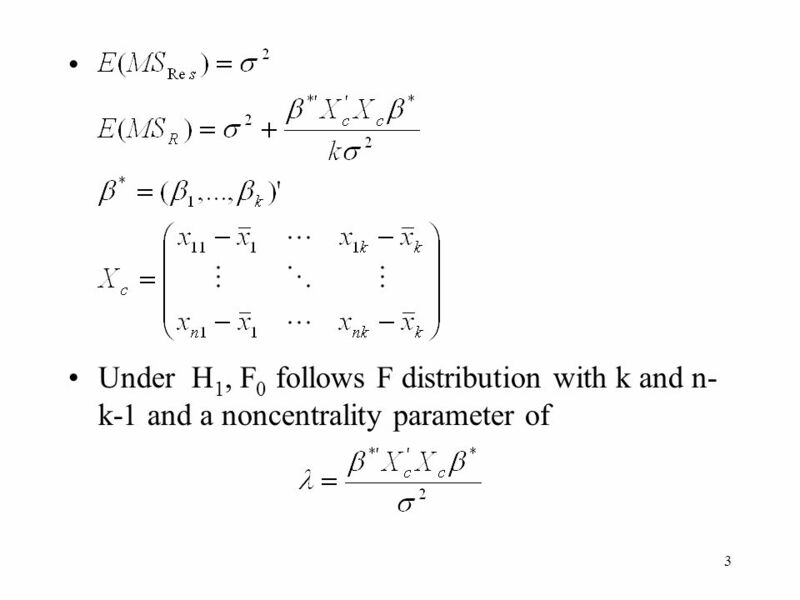 (c) 2007 IUPUI SPEA K300 (4392) Outline Least Squares Methods Estimation: Least Squares Interpretation of estimators Properties of OLS estimators Variance. 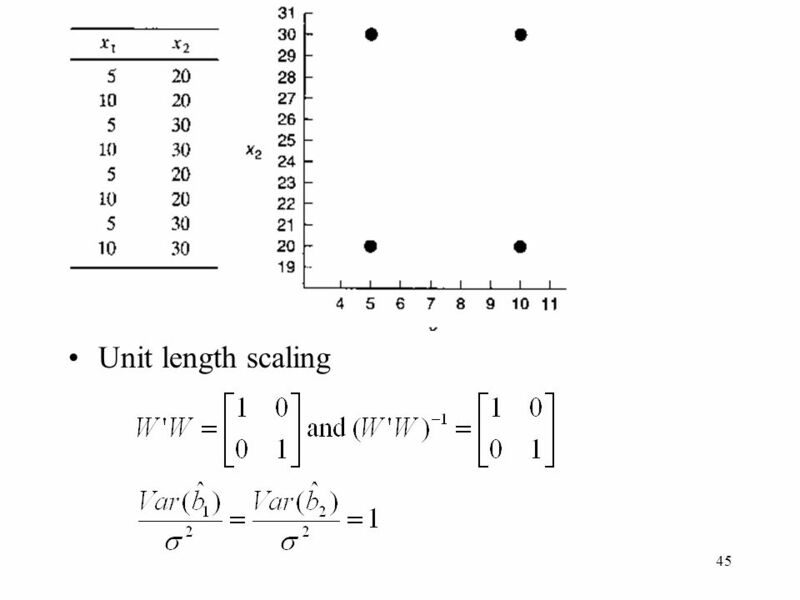 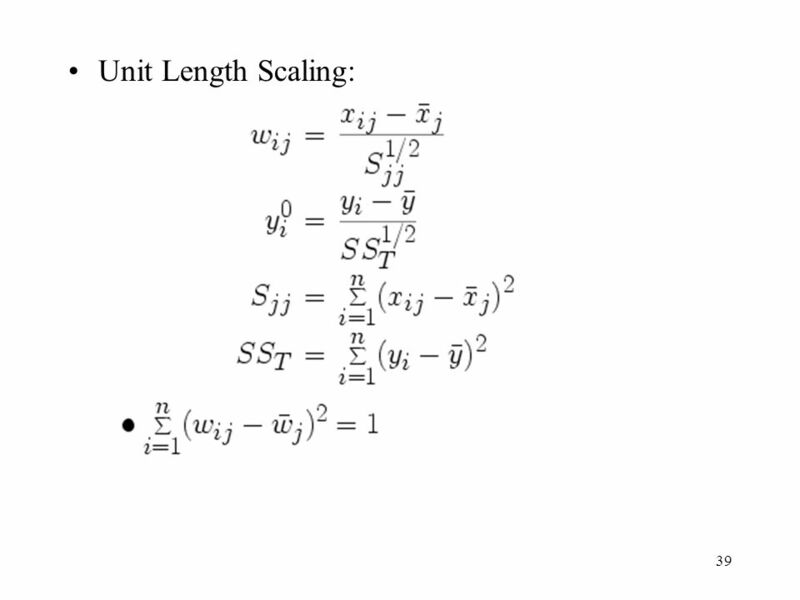 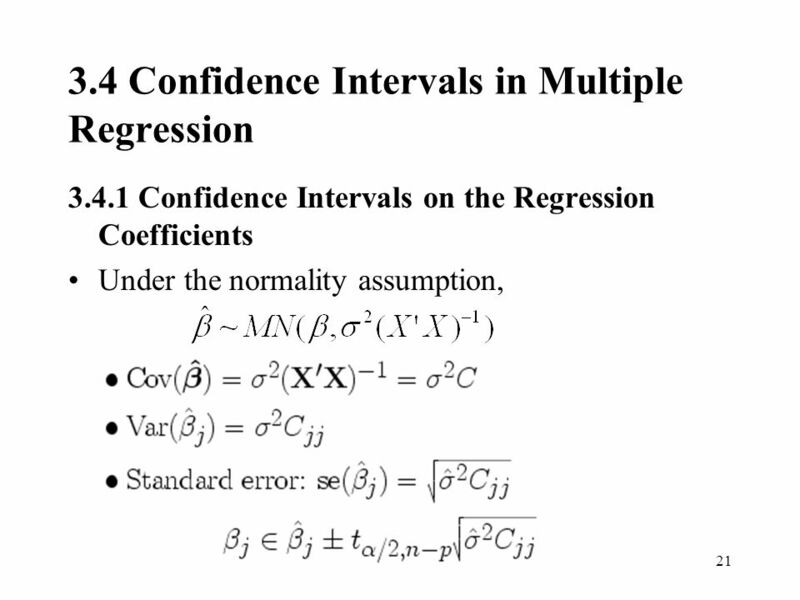 1 Chapter 2 Simple Linear Regression Ray-Bing Chen Institute of Statistics National University of Kaohsiung. 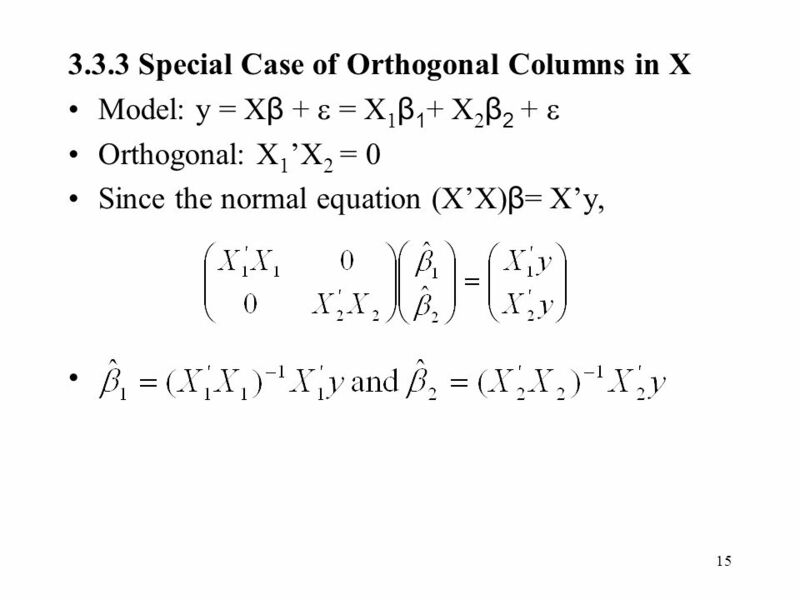 © 2010 Pearson Prentice Hall. 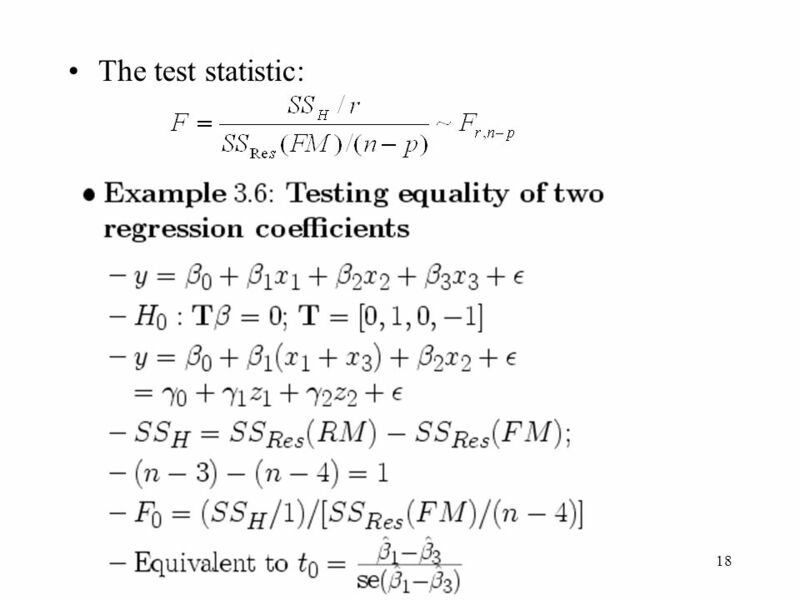 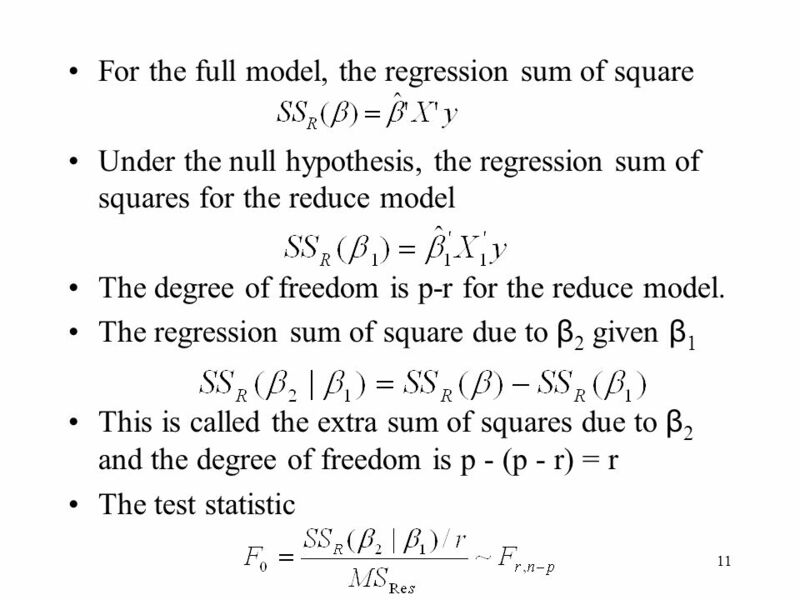 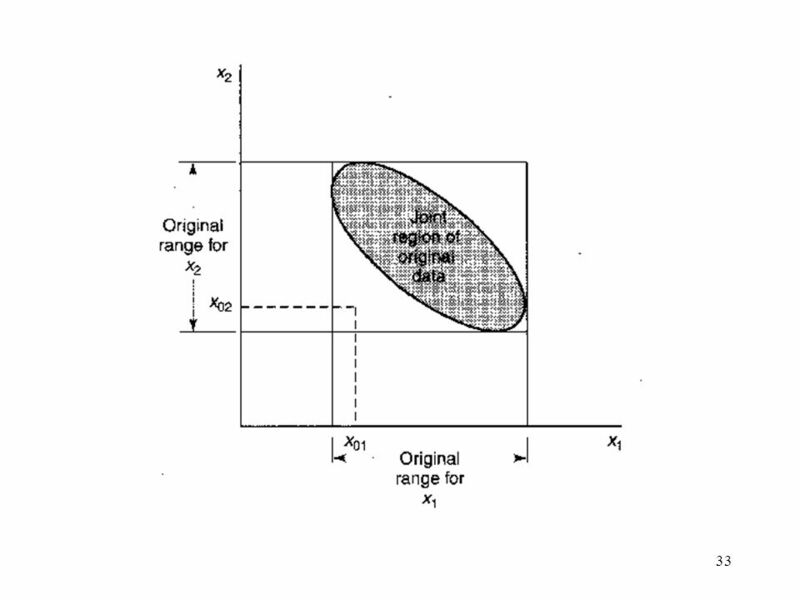 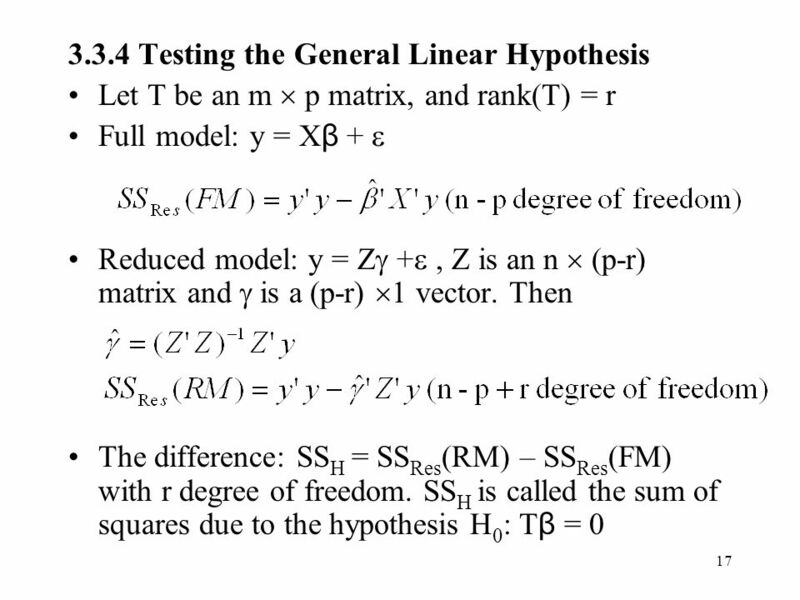 All rights reserved Least Squares Regression Models. 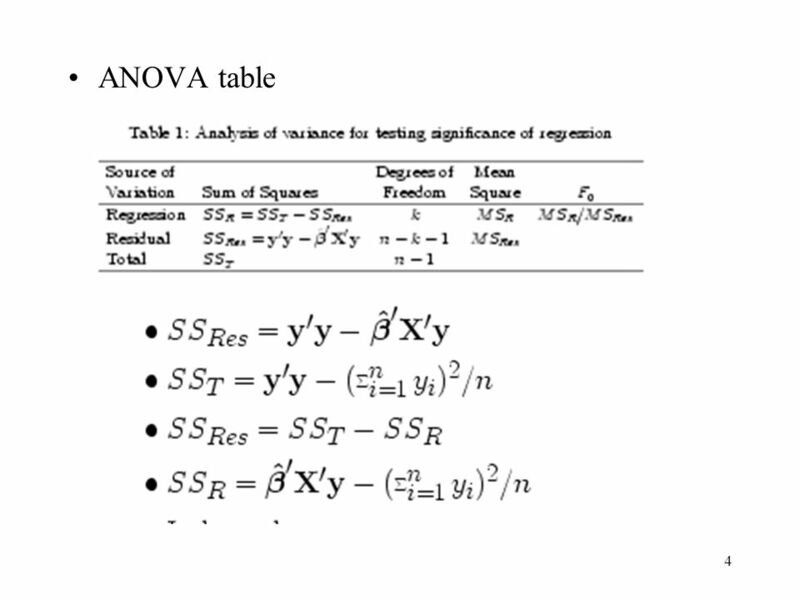 Variance and covariance M contains the mean Sums of squares General additive models. 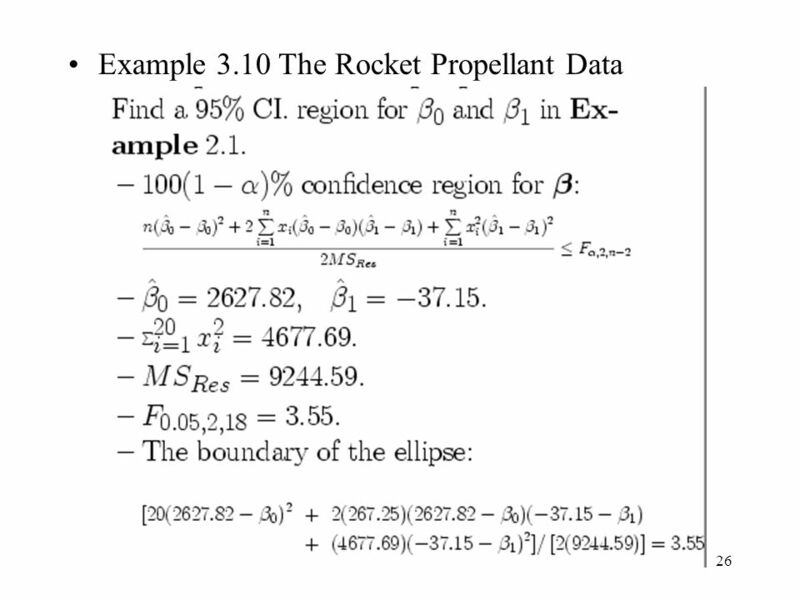 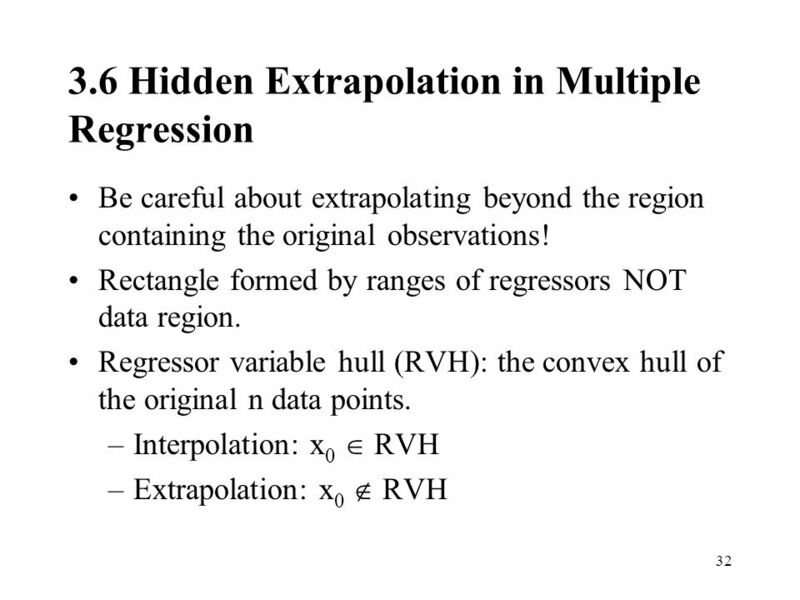 The Multiple Regression Model Prepared by Vera Tabakova, East Carolina University.